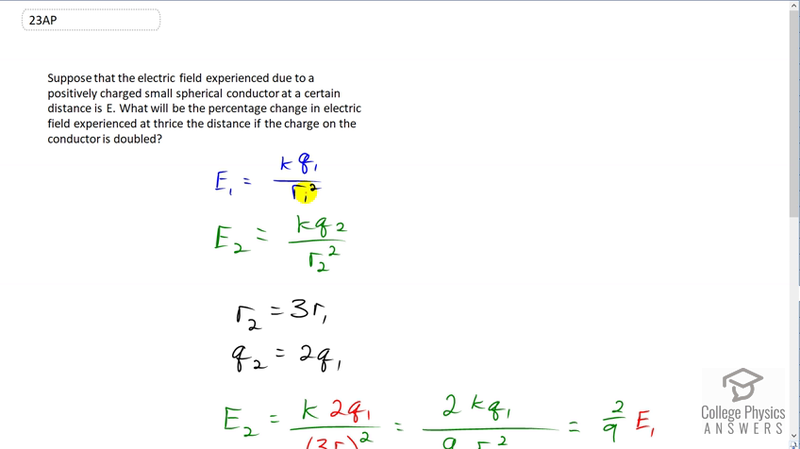 Suppose that the electric field experienced due to a positively charged small spherical conductor at a certain distance is E. What will be the percentage change in electric field experienced at thrice the distance if the charge on the conductor is doubled? This is College Physics Answers with Shaun Dychko. The electric field in the first scenario is Coulomb's constant times the charge one, divided by the original distance from the charge which we call r one squared. Then the second scenario we'll call it electric field two is k Q two over r two squared. We're told that R two is three times r one. So the distances tripled. I sue an old-fashioned word "thrice" to mean times three. So r two is three times r one and Q two is going to be double or times two Q one. So we can substitute each of these in this E two formula. So we'll replace Q two with two Q one and we'll replace r two with three r one. That three is in brackets here, also squared. So we end up with two k Q one over nine r one squared. k Q one over r one squared is E one. So we can replace all that with E one. So E two is two over nine times E one. Now, the question is asking for the percent change. Here we go, percent change. So that means you take the difference between E two and E one and then divide by E one. So that's two ninths E one, that's what E two is, minus E oneE one, times 100 percent. Factor out the E one and you end up with E one times two ninths minus one in brackets, and then the E ones cancel and we're left with this line here, two ninths minus one, times 100 percent. So that's negative seven ninths because this one can be written as nine over nine. Then two minus nine is seven all over nine, negative seven I should say. This works out to negative 77.8 percent. So there is a 77.8 percent decrease in the electric field when tripling the distance and doubling the charge.